Bee Cozy winter hive wraps are made with recycled high density materials layered with R8 insulate protection to reduce heat loss from the hive. They are lightweight and easy to slip on and off your hives. Wrapping and unwrapping is very fast and can easily be done by a single person. No unwrapping is required to check the hives. Wraps have a 5+ year average life expectancy. After you take them off your hives in the spring, store them in a clean dry place. Use a hive strap to secure the lid and your hive together to prevent the cold winter winds from blowing the lid off! These wraps will fit snugly around a 10 frame hive; they will also fit around an 8 frame hive with a little modification. This Bee Cozy will fit a 2 story tall bee hive. Place the Inner Cover Pad between the inner cover and the lid. Having an Inner Cover Pad + Bee Cozy winter hive wrap will provide the extra insulation layer to support the bees in retaining heat. 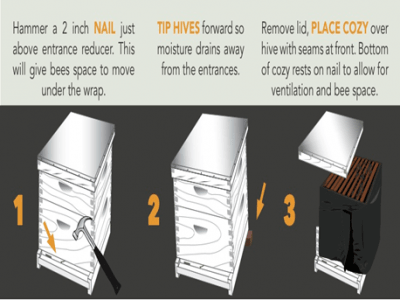 Find information here on the many benefits of Bee Cozy Winter Bee Hive Wraps. Love these, they are easy to install and keep the bees warm.